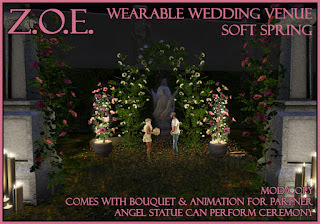 A very long time ago in my Second Life, long before I found this most beautiful home I have now, but long after I met my husband, a friend of mine dragged Rawk and I to a place. This was her latest venture she'd started in a fit of defiance for having been most rudely fired from a larger venue. She was sick of following the "rules" and said screw it, and started her own club. Saloon, actually. She'd been trying to get me to DJ there for a while, and I'd kept declining, until one night Rawk and I were there at her set... drinking (as all these stories start), and she was harassing me yet again. I finally told her, if Rawk hosts for me, I'll DJ. Of course, I was fully assuming he would vehemently protest and put his foot down saying NO. At this point he wasn't working in SL at all. He didn't have to, and had no urge to. Unfortunately, Rawk either didn't get that hint, or he really just wanted to throw me under the bus, because he drunkenly replied, "I'd love to!!!!" I still say he had a thing for Kat when I met him. At the least he looked up to her like a big sister. So there it was. I was stuck working at The Steel Horse Saloon. But, it was there I met so many people that eventually became family to us. We had some amazing times there, grew close, and when the doors finally closed, I'd call it a success. 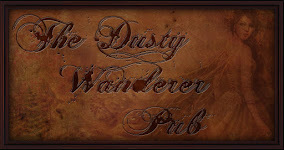 Rawk and I decided to open our own little place, The Dusty Wanderer Pub. It did pretty well, we started off doing only Saturday night sets, then grew to 3 nights a week plus live performer nights. 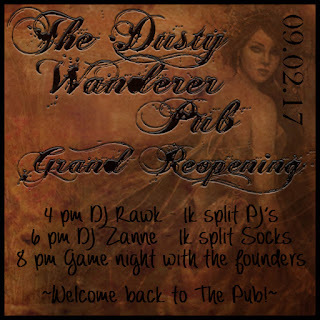 The pub (to this day when you say "the pub" all our close friends automatically think of DW) had started as a very large game room that we built from ground up, and we just decided to open it to friends and also satisfy our DJ addiction once a week. It grew and grew, and again, many great times were had... SO many amazing memories. I couldn't even begin to list them all here. We made new friends, added MORE family. As all good things come, they must also go. After over 3 years, we closed the pub doors not with a goodbye, but with a "see you soon". Not very long after that, the funniest thing happened. My SL brother (from back in Steel Horse days) Jsun, told me I should come DJ for this new place he's managing. Of course, I balked. First of all, I had been HIS boss for ages. Second, the thought of working for someone else anymore makes me ill. I'd rather DJ from my back yard if I have to fulfill a tweakfest from DJ withdrawal. He assured me though, that the owner wasn't like that. The only rules are the same ones I always lived by anyway. Don't get naked. Don't be a TOTAL asshat. Don't play Nickelback. Sorry NB fans, but there ya go! Another story for another time. I thought well, maybe it'll be like SHS days, the family back together, etc. He and his lovely wife Laks then introduced me to the owner. Her name was Dusti. Dusty like my pub? Really? Rawk and I can still DJ Saturday nights at 6 pm and alternate weekends? Seriously??? I can play whatever the hell I'm in the mood to play, too???? This seemed like a cosmic blessing. A sign, if you will! It's been about a year now, and at this point I'm also the resident Pixel Twister in charge of the purdy things, builds and whatnot. I'm "management" supposedly, but I don't have to manage anything but prims. This is a freaking dream come true for me, you have no idea. A place I can get my DJ fix, meet and congregate with great people, express my creativity in many and varied ways. A place I am proud to call my SOUL HOME. This is The Rhythm Factory. Best Bunch of People in the whole wide world work here! !